African Travel Specialist, Gemma shared with us the highlight of one her Namibia adventures – the sand dunes at Sossusvlei. Situated in the South of the Namib Desert, the Sossusvlei desert provides a landscape of endless horizons, dramatic dunes and jagged mountaintops. Sossusvlei features some of the highest sand dunes in the world displaying brilliant earthy shades of orange, red and brown. Over 230 metres tall and ever changing shape by the wind, these dunes are different each time you visit. Be sure to try catching a sunset from the top of a sand dune. There’s nothing quite like it! Imagine being witness from above watching the light of dawn waking up the the Sossusvlei Desert. See the sun rise above the dramatic dunes as your balloon floats slowly to the sky revealing the vast desert below. 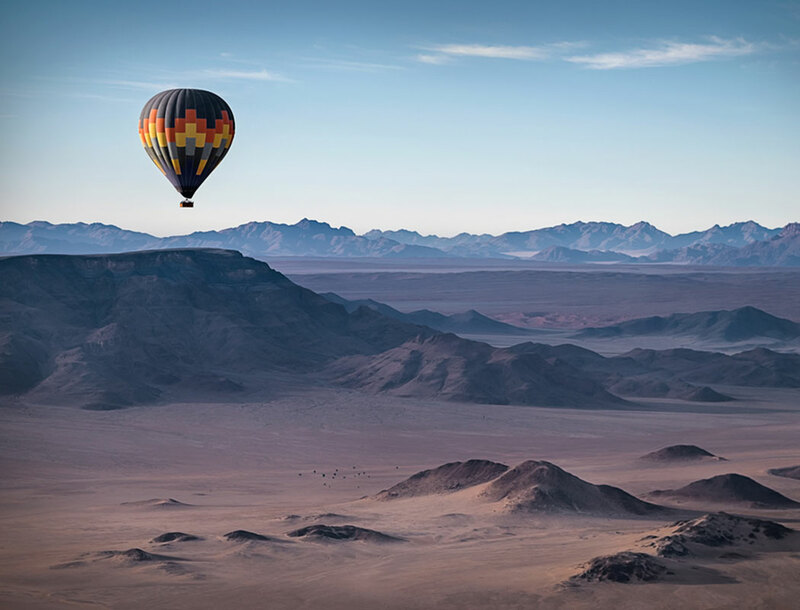 The balloon ascends at wavering heights and continuously rotates in accordance the morning wind which offers ever changing views of the desert below. Your birds-eye view allows you to see the various animals in action, particularly large herds of gemsbok. Furthermore, you can spot the mysterious “fairy circles”– empty concave circular patches. These have long been a fascinating marvel of the Namib Desert. When most people think of Namibia, desert and dunes are the first things that come to mind. However, this spectacular country has more to offer. Starting with the spectacular Walvis Bay. Here you can enjoy an array of marine cruises that explore the bay. Lasting for a few hours, these cruises offer the chance to see an array of wildlife, from Bottlenose and Heavyside Dolphins, Cape Fur Seals, as well as penguins, Leatherback Turtles and even whales from July to November. The bay is also home to a multitude of birdlife, including flamingos and pelicans. One of Africa’s best national parks, Etosha offers prime game viewing and is a leader in wildlife conservation. The park itself stretches across 22,300 square kilometres and mainly comprises of open grass plains around a huge salt pan, that, after heavy rainfall, becomes a lake attracting large flocks of beautiful flamingo. One of the wildlife highlights of Etosha, is without a doubt, the black rhino. The National Park holds one of the largest and most stable populations of this critically endangered species in the world. You’ll also find giraffe, black-faced impala, Hartmann’s mountain zebra or the smallest antelope in the world, the Damara dikdik. Packing for Namibia is pretty much the same as any African Safari, so be sure to check out what to bring here. Swakopmund is close to atlantic ocean, and thus with the ocean winds, it can get fairly cold, so make sure you bring a jacket, layers are always a great idea. Another tip is to bring fully enclosed walking shoes with no mesh if you’re planning on walking through the sand dunes. You’ll find that shoes with even the tiniest of holes will fill up with sand very quickly. When staying in Sossusvlei, our top lodge is andBeyond’s Sossusvlei Desert Lodge. A secluded lodge situated amongst the dunes, offering luxury suites with outdoor showers, and a large skylight above your bed, for some of the most exceptional stargazing all night long. Designed to resemble the shipwrecks along the Skeleton coast, this luxury camp offers 10 luxury suites, (8 twin and 2 family suites). Start your day with a delicious sunrise breakfast overlooking the astonishing landscape, then explore the dry riverbeds and climb to the top of the great roaring dunes to watch the sun go down. In addition, while the area is known for its dramatic landscape, you may be lucky enough to spot some wildlife; desert elephant, baboon, giraffe and even lions all inhabit this extraordinary area. Located on the beach, the Strand Hotel Swakopmund is the perfect place to stay if you want to explore the city. Only 40 minutes away from Walvis Bay and positioned close to local attractions like the Swakopmund Museum, the Strand offers four-star luxury in an incredible location.